Mr. G, a 45-year-old Mexican immigrant undergoes an employment health screening and learns he has dangerously high blood pressure. He is told he will not be permitted to work until his condition is under control. He goes to a local Georgia emergency room for treatment and is given a beta-blocker and diuretic, each to be taken once a day. The doctor then explains to his colleagues that the word “once” (pronounced “ohn SAY”) is Spanish for 11. Fortunately, the patient’s condition is stabilized, and he suffers no serious harm. Six years ago, this near miss would likely have been just another anecdote or “learning experience” shared by a few colleagues. But the day after this incident, a hospital administrator sends a report to the Georgia Hospital Association’s Partnership for Health Accountability (PHA) describing what happened and asking for help in preventing similar incidents. Although this case is hypothetical, it’s typical of problems routinely reported to the PHA through its five-year-old voluntary medical-error reporting system. Envisioning the banner headlines and civil lawsuits that are so often the result when medical mistakes are made public, administrators blanched at the thought of voluntarily sending out sensitive data statewide. “But over time we developed their trust,” Naylor continues. “They have seen that we are able to share information and still maintain the security of what they send us.” Participating hospitals fill out sentinel-event forms and receive fast, confidential feedback from other hospitals on issues requiring urgent attention. They also regularly report aggregate data on medication errors, incidence of pressure ulcers, and other common problems to a centralized database. Hospitals can choose to report information in all categories or just select individual areas to focus on. The association analyzes this information and prepares a report comparing each hospital with other institutions of similar size and capability across the state. Periodic teleconferences also provide a forum for sharing experiences and strategies. Today, administrators from across the state frequently call to suggest ideas for safety alerts and share concerns and problems they have had, Naylor says. Georgia’s system has the potential to become a model for other states, says Ken Thorpe, director of the Emory Center for Health Outcomes and Quality (CHOQ) at the Rollins School of Public Health, which is working with the GHA to evaluate and improve the system’s effectiveness. Formed in 2001, the CHOQ is one of the largest research centers in the nation devoted exclusively to evaluating and measuring the quality of health care. Research teams partner with other groups, such as health care providers, large group purchasers of health services, and private insurers, to evaluate problems and design interventions. Hospitals across the country have been under fire since a 1999 report from the Institute of Medicine estimated the number of people killed by medical errors in hospitals each year to be between 44,000 and 98,000. The report sparked a nationwide push for more oversight of health care providers, particularly hospitals. Several states passed laws establishing mandatory reporting systems, which publicly rank hospitals by the quality of care they provide as determined by the number of errors reported. But many providers believe these efforts are flawed. Systems designed to measure quality often evaluate small community hospitals by the same benchmarks used for large, urban academic medical centers, with the result that neither is evaluated fairly. Large centers have more resources but also see much sicker patients and therefore have higher rates of death and other poor outcomes. Many initiatives also base their rankings on information obtained from data sets not designed to measure quality of care. Even the term “medical error” can be confusing. Clearly, prescribing the wrong medicine or amputating the wrong limb counts. But what about the patient with limited literacy skills who takes 10 times the appropriate amount of medication because he can’t read the bottle’s label? Or a surgical patient with multiple co-existing medical conditions who gets an infection while in the hospital? Should poor outcomes that are the result of many complicated factors be reported as medical mistakes? At the same time, rising rates for malpractice coverage give hospitals powerful incentive to hide, not report, any problems they have with patient safety. In some states, information about hospital quality-improvement projects can still be “discoverable” by attorneys in a malpractice case, who then use the institution’s effort at correcting a problem as evidence that the institution was at fault. Georgia’s system—with its emphasis on communication, correcting problems, and finding best practices—has been key to encouraging hospitals to move closer toward the “culture of safety” necessary to truly improve, says Bill Bornstein, chief quality officer for Emory Healthcare, which participates in the reporting system and has won three of its statewide quality awards. For too long, he says, the nation’s health care industry has adhered to the belief that mistakes are the result of individual error and that if all people hired to work in a health care facility are willing to work hard, are trained appropriately, and are always diligent, then mistakes won’t happen. However, other industries also charged with maintaining the safety of large numbers of people—notably the aviation industry—have rejected this kind of thinking. Aviation now follows total quality management and quality-improvement processes that focus on identifying potential problems before they escalate to the point that an accident can occur. The goal is designing systems and practices to eliminate the potential for mistakes to occur. “They accept the concept that human error is inevitable and predictable in terms of frequency, and that if you want to avoid errors resulting in harm, you must design systems to intercept and prevent the occurrences before they lead to harm,” Bornstein says. Implementing a culture of safety means that health care facilities must look at incidents as evidence of a system failure in need of correction instead of wasting effort trying to decide whether a bad outcome was the result of a “mistake,” he says. A good example of this shift in philosophy is Emory Hospital’s correct-site surgery protocol, now the model used by the PHA to develop its statewide guidance for other hospitals. Emory’s protocol was developed in the late 1990s, well before the 2003 Joint Commission on Accreditation of Healthcare Organization’s decision requiring hospitals to implement similar processes, he says. The policy is continually reevaluated and has since been expanded to include all invasive procedures performed at Emory Hospitals and The Emory Clinic. “We use a three-pronged approach ensuring we have ascertained the following for each procedure: (1) the correct patient, (2) the correct procedure, and (3) the correct site,” says Jane Vosloh, director of nursing, perioperative and endoscopic services for Emory Hospitals. When a patient is admitted to the unit, providers must verify the person’s identity and ensure that critical information—particularly a current history and physical examination and documentation of informed consent—are included in the chart. Once that process is complete, the patient is given a colored armband identifying the service to which he or she is admitted. The correct site of surgery is also clearly marked on the patient. And the policy prohibits caregivers from marking up the surgery site (or proceeding with planning for the procedure) without reverifying the patient’s identity and the planned procedure against the information in the chart, documenting both verifications in the record. Several checks and balances are built into the protocol, so that even if one person forgets to perform a check, someone else down the line has the same responsibility, says Vosloh. Finally, prior to the start of the procedure, a mandatory time-out (officially known as the “call to order”) is taken for a final check of the patient’s identity, site of surgery, and the procedure to be performed. At first, many surgeons resisted taking all of the steps required, says Vosloh. They considered it a point of professional integrity to “know their patient” without repeatedly checking his or her identification. However, one memorable incident several years ago convinced many. The error was caught in time and corrected, but it demonstrated how mistakes happen to even the best providers. Emory’s CHOQ research indicates that the Georgia system is both improving the quality of patient care and attracting hospital participation. Analysis of the data collected over the past five years shows a 35% mean decrease in reported error rates overall, says Kim Rask, a practicing physician and center researcher who holds joint appointments in both public health and medicine. All of Georgia’s hospitals participate in at least one of the PHA’s reporting initiatives, she notes. The medication-error initiative is the most popular, and most hospitals participate in at least two. 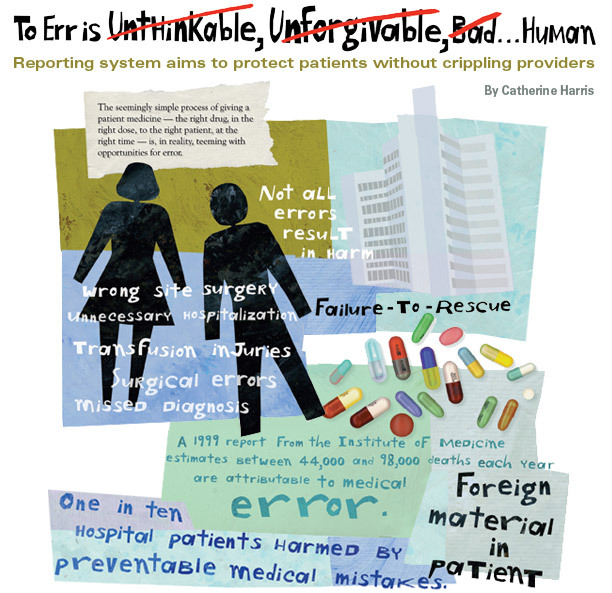 A recent evaluation of medication-error data found that 80% of participating hospitals have lowered their error rates. “Even for the 20% that saw no improvement or saw their rates get worse, we are encouraged that they were willing to report those findings and that they continued to participate and try to improve,” says Rask. “If everyone had done better, you would always have to wonder about your reporting. When the Institute of Medicine’s report, To Err is Human, was released, officials at the Georgia Hospital Association (GHA) knew they had to act quickly, says association president Vi Naylor. “We had a limited window to develop a reporting system that we felt would be accurate and would help improve patient safety—or have one imposed on us from the outside,” she says. The GHA’s first step was establishing the Partnership for Health Accountability (PHA) and getting its Accountability and Health Safety Committee recognized as a state peer-review organization. Georgia’s state peer-review law protects information collected for the purpose of improving patient care from public disclosure and legal discoverability. The PHA then set up a reporting system to track medication errors and a select number of other medical events. The reporting system is completely voluntary—hospitals are not punished for not submitting data, but if they choose to do so, they gain access to information about how their data compare with those of other hospitals of comparable size and type, as well as information about evidence-based best practices. The PHA also sponsors periodic telephone conferences that allow administrators at different facilities to share ideas and experiences. The system provides confidentiality for reporting of medical errors and sentinel events, but the GHA also believes public accountability is vital. Each year, the PHA publishes a report, “Insights,” (available on their website at www.gha.org/pha) which lists each hospital by county and indicates whether it participates in both national and statewide quality-improvement initiatives. A separate section details whether each hospital meets certain care benchmarks set by the Joint Commission on Accreditation of Healthcare Organizations and the Centers for Medicare and Medicaid Services. Catherine Harris is the editor of Momentum. current issue . past issues . contact us.